Hello friends, starting from the previous post, we could associate hydrogen as fuel with a fuel cell (FC), which is an electrochemical device whose fundamental operating principle was discovered in the year 1839, by Sir William Grove. While the researcher experimented with electrolysis, he happened to notice that the inverse process - that is, combining hydrogen and oxygen - produced water, electricity and heat. At the beginning there was enthusiasm to develop devices that take advantage of this phenomenon. However, the difficulty in obtaining suitable materials, which until today are still expensive, and the development of the steam engine and later of the internal combustion engines, left behind for a long time developments in this line. 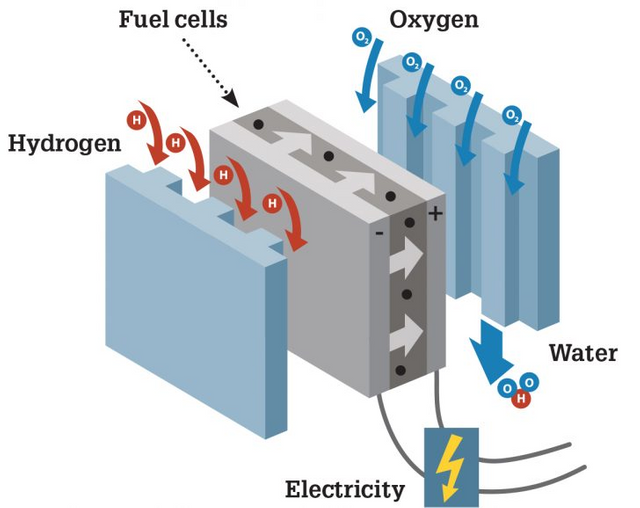 The principle of operation of the fuel cell (PEM) is based on the direct conversion of chemical energy into electrical energy through an electrochemical reaction. It is convenient to use the PEM type cell as a reference since the other cell types occupy the same principle, but with different constructive characteristics and fuels used for the generation of electricity. In general, a FC is composed of two electrodes (anode and cathode) separated by an electrolyte. At the anode and cathode of the FC, hydrogen (H2) and oxygen (O2, oxidant or air) are injected respectively. The components that react (H2 and O2) do not come into direct contact, since they are separated by the electrolyte, which only allows the passage of protons or ions depending on the type of cell. The catalysts (electrodes) coat the faces of the electrolyte. Once hydrogen enters, the anode catalyst splits it into electrons and protons. In the case of existing electrical consumption, a circulation of electrons is established through the charge, while the protons migrate to the cathode through the electrolyte. The cathode catalyst combines the protons with the returning electrons and oxygen from the air to form water and water vapor (see Figure 1). The reaction has an exothermic characteristic (heat release) which is increased by the resistive effect of the electrolyte. 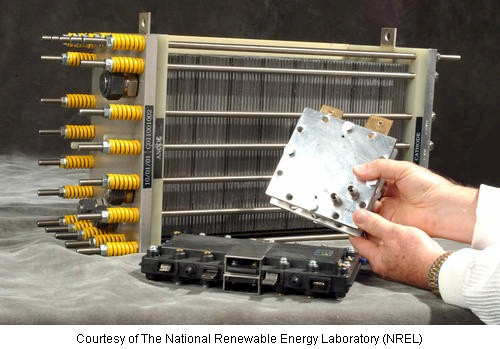 For practical applications, a single fuel cell is not enough, several of them joining to get the right power and tension, thus forming a fuel cell. The direct current provided by the battery must be transformed into alternating current suitable for consumption, with special attention to the electrical parameters (voltage, frequency, harmonics, etc.) of the network. The electrical part in charge of this transformation is called the energy conditioning system, and its most important component is the inverter, which transforms the direct current produced by the battery into alternating current. Spiegel, Colleen. Designing and building fuel cells. Vol. 87. New York: Mcgraw-hill, 2007. This post has received a 23.71 % upvote from @boomerang.